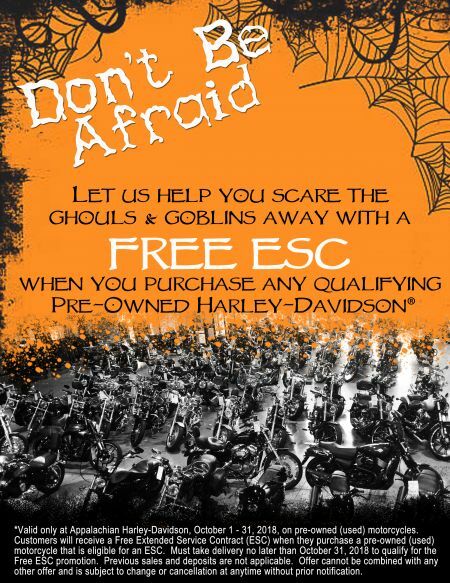 Let us help you scare the Ghouls & Goblins away with a FREE ESC when you purchase any qualifying Pre-Owned Harley-Davidson®. *Valid only at Appalachian Harley-Davidson, October 1 - 31, 2018, on pre-owned (used) motorcycles. Customers will receive a Free Extended Service Contract (ESC) when they purchase a pre-owned (used) motorcycle that is eligible for an ESC. Must take delivery no later than October 31, 2018 to qualify for the Free ESC promotion. Previous sales and deposits are not applicable. Offer cannot be combined with any other offer and is subject to change or cancellation at anytime without prior notification.